Here is one of my core-strengthening and hip-opening sequences. Let me know in the comments which poses were challenging, which you love, and which ones were the pose you love to hate. Let this be time to practice and feel. Ardha Navasana (long, low boat pose): Start lying on your back, arms by your sides and legs together as one unit, feet in Tadasana. Lift you head and look at your feet. Curl up a little higher to bring the shoulder blades off the ground as you reach your fingers towards your toes. 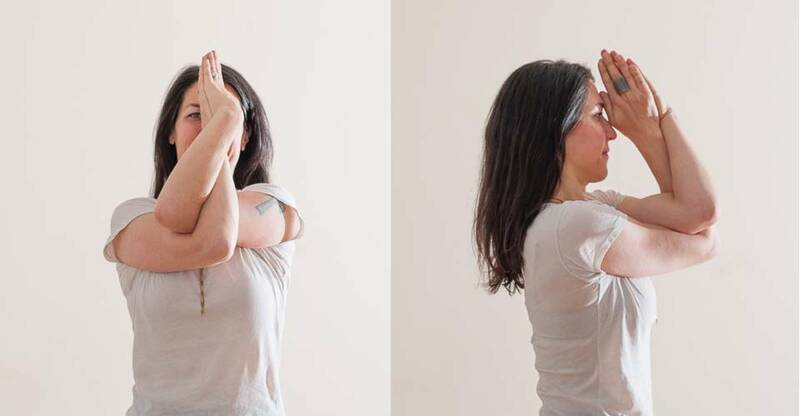 If you feel any tension in the neck, support the neck with your hands. Next, lift the legs to the height of your shoulders. Keep the entire body engaged. Hold for at least 3 breaths, then release the legs, shoulders and head back to the ground. Do as many reps as you’d like. Aim for at least three reps.
Utkatasana (Chair Pose): Start in Tadasana, with your arms lifted in front to shoulder height. Bend your knees to come into your “chair”. Keep the knees back so they don’t go past the toes. Maintain an anterior tilt to the pelvis while lifting the bottom of your belly. Lift the sternum up and lengthen your side waists to keep the front body long without compressing the low back. Stay for three to nine breaths. Do at least three reps.
Full Garudasana: Do the arms as shown above, with the left arm on top. Take a slight bend in your knees and pick the right leg up and cross it high at the groins over the left leg. Whichever arms is on top, the opposite leg will be on top. Hug the inner thighs together and lift the bottom of your belly. Draw the shoulder blades down and apart. Alrighty, folks! Hit the mat on Saturday at 10 am and let me know how this sequence feels.